I’ve mentioned this before in a number of posts but it’s such a feature of my everyday life I think it’s inevitable that it will just keep coming up from time to time. It’s about me and people’s names and how I have such great difficulty in keeping them in my head. I’ve worked at it, I really have. I focus on it when I’m meeting people. I try all the tricks, I repeat your name back to you when you tell it to me. I associate your name with some image in my head, I make a rhyme out of it. Nothing works. People tell me it’s a sort of laziness, even a type of arrogance. I’m so interested in what I am about to say to you that I can’t even be bothered hearing you say your own name to me, letting it register. I don’t know about all that. I hope it’s not true. All I know is that I would really like to be able to remember your name and say it back to you as a common courtesy whenever we meet, just like regular people do. Instead, in an attempt to treat people equally, I will use nobody’s name. Even close friends, whose names I do know, will be treated with a generic ‘Hiya’ or ‘How’s it going?’, probably to draw attention away from the fact that I really don’t know the name of the guy standing next to you. Anyway, whenever I start with a little spiel about this failing of mine, it invariably leads to an anecdote to illustrate the social problems it regularly lands me into. A while back, I was sitting in a coffee place having a coffee when the door opened and a guy came in. He was carrying a fair-sized steel case of the kind that photographers sometimes use. He looked around and then turned to the lady behind the counter and had a few quiet words with her. Then he came down the room to find himself a seat. He passed my table, his case almost brushing my leg. Then he was gone past. It was. It was really me. Then silence. Expectant silence. He sat down and looked across at me expectantly. Here’s the thing. I knew who he was. He hadn’t changed all that much either. A bit of ‘timber’ but we all had that. He was the guy from St. John’s National School. He lived out the road a bit. We had hung together now and again a bit and had even gone to see a Bruce Lee flick together once. He was okay, one of the good ones. My mind ran though thousands of possibilities as I kept up a passable discussion about times gone by and where various people are now. As each of those people's names were mentioned, I mentally ticked it off my long list of what this person might be called. The lady from behind the counter approached our table. “He can see you now,” she said to him, this guy, whatsisface. Great. He went off to see the manager, leaving me with his case. Sometimes there’s an odd thing that works for me. If I can’t think of something, If I ask myself the question out loud, the answer sometimes comes to me. I know it sounds strange but it’s true and it seems to work better the older I get. Desperate measures, perhaps. “What is that guy’s name?” I asked myself and I must have said it a little too loudly because several people at other tables glared over at me. It was a wasted effort in any event because it didn’t work. His name would be in his case. On some letter or document or something. Maybe even inscribed on the inside for security reasons. All I had to do was look inside his case, quickly, before he came back. “Yes. Sorry” I said and then I said his name. It was great to know it. It was an awful experience, obviously. The nervousness of breaking into the case, the getting caught. The slightly iffy cover story. But, just for a minute there, riffling through those files illicitly, in danger of being discovered at any moment, I felt... edgy... alive. 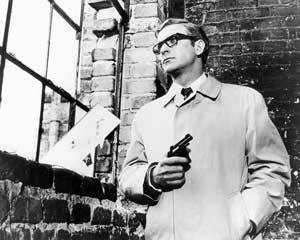 A little bit like that fella off 'The Ipcress Files'. Even before my memory started to go I was the same, Ken. Perversely I have an excellent memory for faces. At least I think I still have. The main way I get to test that is with the TV. One of the things that both Carrie and I get a great kick out of is spot-the-actor. Whenever a new show comes on we both try to identify where we’ve seen the actors before. Their names aren’t especially important. For example, Carrie and I have just finished watching the latest series of Happy Valley and there was a (can we still use ‘retarded’?) character who we both recognised: Pythagoras from Atlantis. The bad cop was Mr Molesley from Downton Abbey. In Doctor Thorne last night Annie from Community made an appearance. It doesn’t matter that Alison Brie’s been in another fifty-odd films and television shows she’s Annie from Community. The names of characters are quite another matter. Let’s think, who from Community can I remember after five seasons? Jack, Pierce, Sanjay, the guy who’s in Dr Ken now, the guy who’s in Master of None now, the girl who reminds me of the girl who was in all those Police Academy films only it’s not her… You see what I mean. It’s not Sanjay, it’s Abed. And it’s not Jack, it’s Jeff. Well at least I got Pierce although I thought that was his last name to be honest. Sanjay is from The Simpsons. I probably wouldn’t do much better with The Big Bang Theory although I could probably name the crew of most of the Enterprises (including the Enterprise-C); I just checked and the captain was Rachel Garrett and here I thought it was Lesley Garrett who’s actually an opera singer. In the real world I tend to call women ‘pet’ which saves having to remember anyone’s name. Men I don’t call anything. I always hated starting a new job when you were suddenly faced with twenty or thirty names you pretty much had to get down within a couple of days to save offending anyone. I can’t recall having any real trouble in that regard. Having an extension list as an aide-memoire is always a help. Hi G. Thanks. I did know this story about the unnamed character from Deighton's books. It's one of the reasons I name checked him in the post. What I had forgotten was that there was a fourth 'Palmer' novel that was never filmed, called Horse Under Water. I'll have to seek that one out. Always liked a bit of Deighton. Ha I have the same problem, I always had,but I find its much easier here in Australia, they love name badges, its a bit of a giveaway but you do have to learn to be able to glance at their name badge while saying hello and not being too obvious and just to keep the mystery I hardly ever wear mine! I know this syndrome SO well. I find it most dreadfully embarrassing. I can remember not only people's faces but also can often repeat conversations that we'd had years ago verbatim and even remember their car registration numbers and land line telephone numbers. All useful/useless information is there except the one at the very top of the list of useful column. A name. I reckon it's some sort of reverse synaesthesia. I would like it to stop. Or I would like the entire human population to wear name badges. If it did it would be great but alas no it dosnt, maybe that's why I don't wear it! !